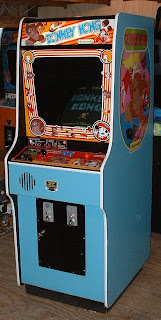 From the first glimpse of that sweet old Nintendo cabinet, I knew that was what I wanted to build for my MAME-project. The idea of getting myself a Royal Video universal-type arcade cabinet was abandoned and I started to do a lot of research. I bought buttons, joysticks and an I-PAC (for connecting it all to a PC USB or PS/2). Meanwhile I was searching for a proper monitor. I didn't just want to use my LCD- or CRT-monitor. That would be easy but not true to the real arcade feeling. Then I stumbled upon a Hantarex 21" videowall monitor. Seems like a good choice for a MAME-project because it is the same brand as used in original arcade cabinets and this one even has VGA-input! So no need for buying a J-PAC adapter or whatever to connect my PC to the monitor. Just Plug and play. And probably some other settings, but these are the most important ones. Although I still have to get rid of the mouse-cursor in some way. 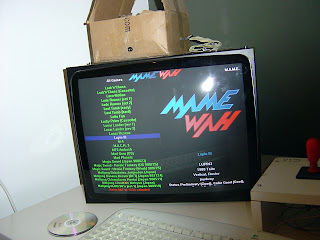 About the software, I mentioned the MAME-frontend. At this moment I am experimenting with MAMEWAH because it's one of the most popular ones. The frontend 'hides' the windows-look of the emulator you're using. In my case, MAME32. A windows-based emulator. your machine is a beauty ! i think there is an option in MAME to hid the mouse cursor. how did you change the windows boot up settings ? im trying to do that with my computer. im using MAME 32. also good idea to build a test pannel. i wouldnt have thought of that, but i think ill do that also.